Goodreads: Dr. Heather Reilly has been an anti-war activist since her brother died fighting the Taliban. But her crushing student loans drive her to take a job working on a peace plan for Afghanistan, in the last place on Earth she ever thought she'd be employed: the Pentagon. On her first day, however, her position is eliminated and she’s shuffled to a war-fighting office focused on combating Russian aggression. Unfortunately, she knows little about Russia and has deep moral reservations about war. Making matters worse, she’s also working for Ariane Fletcher—a woman so terrifying, she eats generals for breakfast. 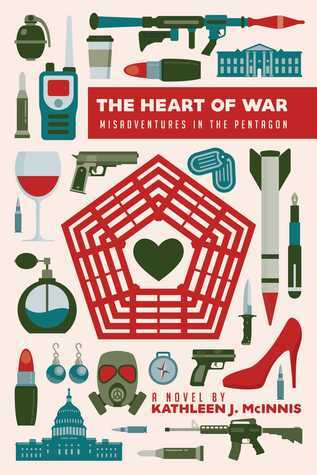 As Heather learns to navigate the Pentagon’s insane bureaucracy and petty power struggles, she finds that her successes come at the expense of her personal life... and that small mistakes can have major consequences in the Department of Defense. Kritters Thoughts: Many women's fiction stories focus on a woman's personal life and relationships, this book was completely different because the main focus was her professional life, her work life. Dr. Heather Reilly has taken a job at the Pentagon and as a pacifist she is headed to the military center to hopefully curb people away from war and towards reconciliation. One of the reasons I loved this book so much was because it took place in my back door and on roads that I travel everyday. In the Pentagon, on Metro and on streets that are right around me, it was fun that I could completely picture everything that Dr. Reilly was seeing and experiencing. I said this above, but I want to expand on this thought. I loved that this book focused on her professional life. Yes, there was a bit of romance, but really this was all about her work life and how changing careers can really throw someone for a loop. Although there were a few times where the speak was very Pentagonese, so I was a bit confused, but it didn't take away from my reading of the book. I am excited that I loved this debut book so much and I hope that Kathleen McInnis has more books to follow. Disclosure of Material Connection: I received one copy of this book free of charge from Claire McKinney PR. I was not required to write a positive review in exchange for receipt of the book; rather, the opinions expressed in this review are my own.